Portrait of Dr. Leichhardt, the explorer. Illustration by William Nicholas (1807–1854), in: Heads of the People: An Illustrated Journal of Literature, Whims and Oddities, Sydney, 1847. William Nicholas, 1847, Portrait of Dr. Leichhardt, the explorer, National Library of Australia, Rex Nan Kivell Collection; NK720/40. During the colonial period, Australia embodied the last unexplored frontier for many naturalists, including Prussian-born Ludwig Leichhardt, who undertook three expeditions into the continent’s interior. His first expedition (1844–45) started from Moreton Bay and ended in Port Essington; it took 15 months and covered some 4,800 kilometers of unexplored terrain. The expedition proved the existence of a viable route between the east and north coasts of the colony and established Leichhardt’s reputation as the “Prince of Explorers.” “We shall see what the people say when I suddenly emerge from the grave with my pockets full of mountains, mountain ranges, rivers, and streams,” the explorer wrote in a letter on his way back to Sydney (letter to F. A. Schmalfuß, 24 January 1846); the public had already given him up for dead. His next plan—becoming the first European to cross the continent from east to west—was unsuccessful. The first attempt had to be broken off, and he never returned from his second attempt: the entire expedition party disappeared in 1848 and its fate has never been discovered. Leichhardt’s accounts of his travels, his scientific observations, and his natural history collections were well received during his lifetime. His expedition to Port Essington secured him a place in history; his mysterious fate made him into a figure of legend. The first expedition in search of him in 1852 was followed by numerous others. Although the far reaches of Australia continued to be explored and settled during the decades that followed, Leichhardt’s unknown fate was never completely forgotten. In the 1860s the Australian colonies competed to send a successful expedition across the continent from south to north. Starting in 1872, explorers such as Ernest Giles, John Forrest, and Peter Warburton made a name for themselves with their untiring attempts to cross the deserts of central Australia. Leichhardt, the lost explorer, was a reminder of the limits of this geographical knowledge; his final resting place remains an object of speculation today. This nameplate from one of Leichhardt’s weapons is the only undisputed relic of the missing 1848 expedition. Photo by Dragi Markovic. Courtesy of the National Museum of Australia, Canberra. Leichhardt has enjoyed a vivid afterlife in public memory: his name has become integrated into botanical and zoological nomenclature; biographies and historical and literary works draw a portrait that is often full of contradictions. The importance given to his work is influenced by the changing political relations between Germany and Australia, but generations of fans have continued to keep his memory alive. Most recently, he appeared on the diplomatic stage as a symbol of German-Australian ties. 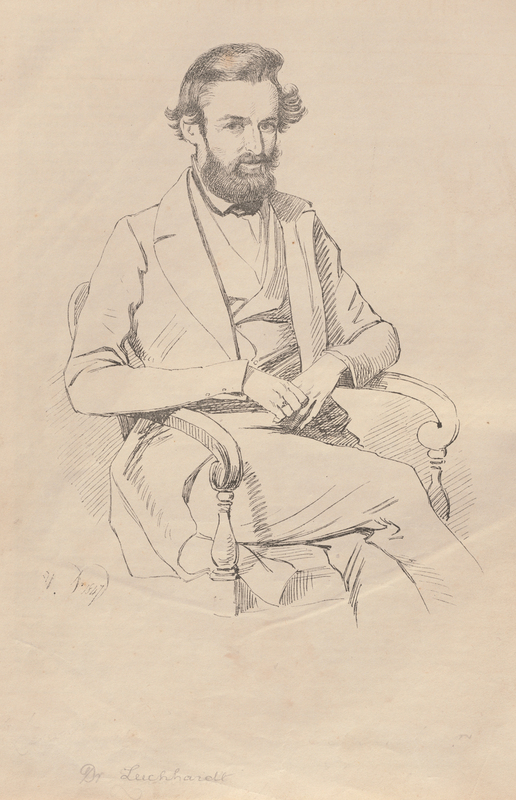 A number of initiatives in 2013 celebrating the 200th anniversary of Leichhardt’s birth made him known to a wider public and contributed to an increase in scholarship on aspects of his life and legacy ranging across biographical studies, ecology, history of science, and cultural studies. Ludwig Leichhardt’s letters to his family form the basis for this virtual exhibition; they are held today in the archive of the Deutsches Museum in Munich. The 17 letters that Leichhardt sent from Australia to his relatives between 23 March 1842 and 22 February 1848 are presented here in digital form and accompanied by an English translation. The exhibition sheds light on the context of their creation and reception; additional material and commentaries draw connections between Ludwig Leichhardt and the environmental history of Australia.